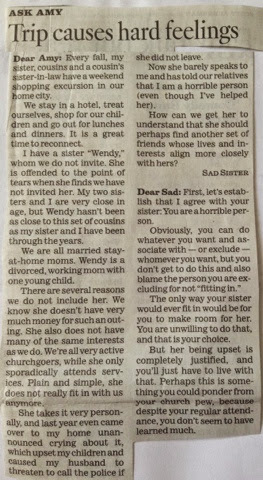 I came across this old Agony Aunt question and response and I thought I'd share it with you for today's Tea Break Tuesday because I thought it was a great response by the agony aunt! Can't believe how mean some people can be to their own siblings! ... Although I did once pull all the ribbon out of my middle sister's Michael Jackson cassette tape in the 80's ... Sorry Kellie! Grab a cuppa ... and your reading glasses for this one! Don't forget to follow me so you don't miss out on next week's Tea Break Tuesday!